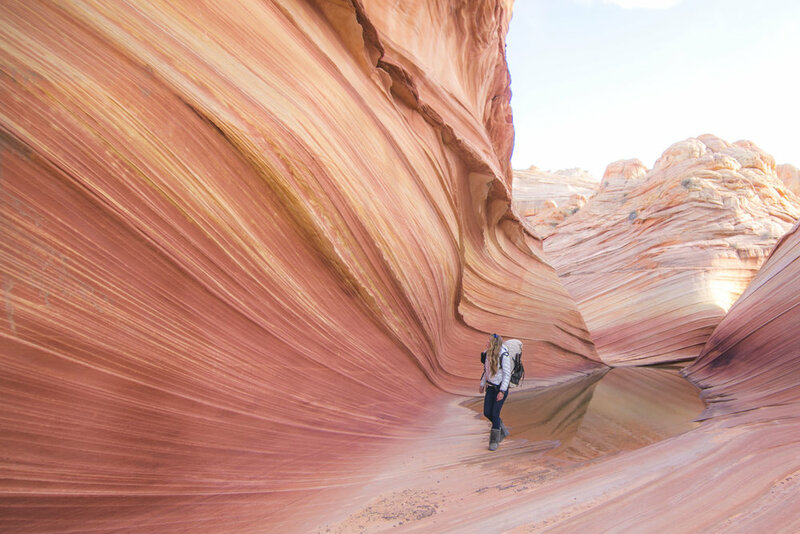 The Wave, located on the border of Utah and Arizona, not far from the town of Kanab, is a geological marvel and has in recent years become a bucket list destination for many hikers as it moved from an obscure insider’s desert gem into the adventure limelight. That doesn’t mean, however, that the Wave joins the ranks of Horseshoe Bend or Antelope Canyon - places that seem to rival Disneyland in their popularity and are routinely overrun with hundreds if not thousands of visitors a day. Terrific landscapes and magnificent photo opportunities, yes, but only if you don’t mind using your elbows to shove your way into that prime photo spot… and no trace left of the wildness or serenity of the desert. The Wave is different. Here, you’ll have to work for your reward. 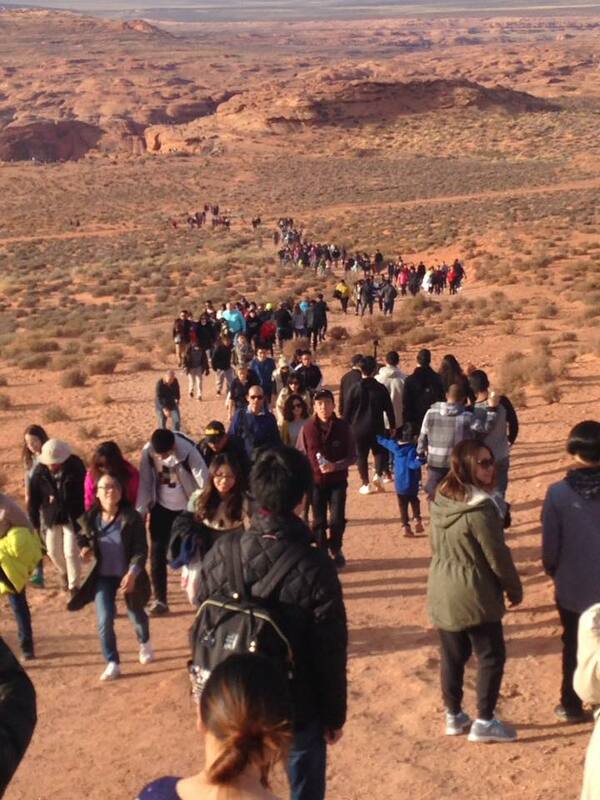 It’s not a matter of “pay $300 to buy into a private photo tour and have your guide shoo the crowds out of the way for you” (Antelope Canyon), nor is it a question of pulling off the highway, parking your RV, and completing a fifteen minute flip-flop slog through the sand to get to that famous turn in the river (Horseshoe Bend). On the contrary, getting to the Wave requires a serious amount of research, planning, luck and tenacity. 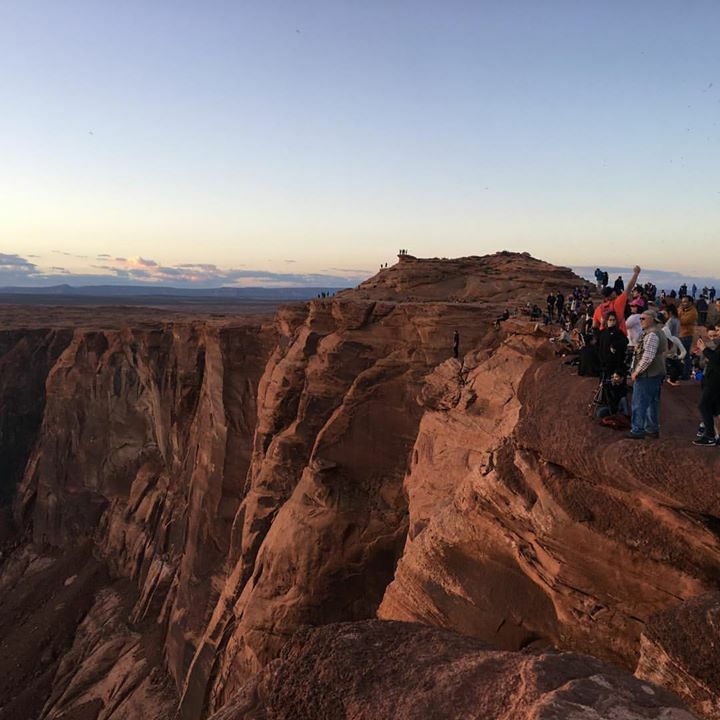 In exchange you get to experience one of nature’s finest masterpieces - and you won’t be sharing that special moment with more than a dozen or so like-minded desert lovers. If that sounds like your cup of tea, keep on reading because you’ll want to know the following five things. Yes, you read that right. Twenty people total, not twenty groups… and there’s good reason for it, too. The Wave consists of spectacular sandstone layers which you are literally walking through, and stepping on, as you’re visiting this outdoor cathedral. The exposed edges of those layers are what makes the Wave so unique but they are also incredibly fragile. No matter how careful we each try to be individually, over time the damage done to the Wave by large numbers of visitors would be irreversible. 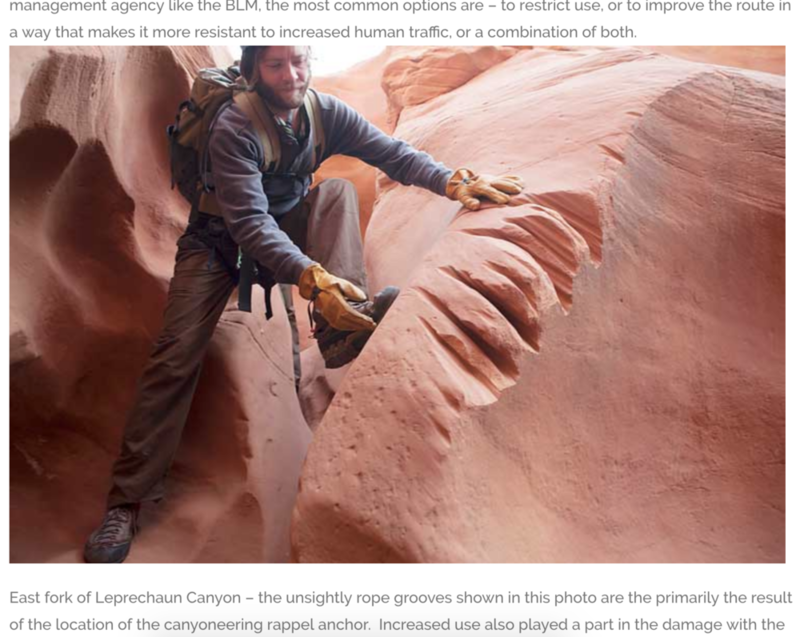 For climbers the susceptibility of sandstone to damage likely needs no further explanation. The reaction of a non-climber or a non-geologist might fall more along the lines of ”But wait: This is ROCK! How fragile could it be? ?” If that is what you’re thinking right now, consider the photo above which shows manmade damage (rope grooves) on rock quite similar to the Wave - and in an area that still receives meaningfully less visitation. Sandstone is fragile. 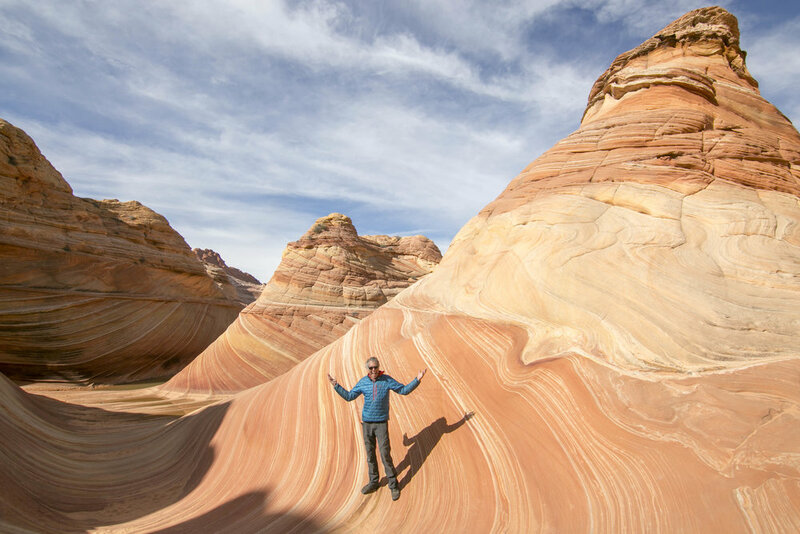 There are two ways to obtain a coveted permit for the Wave: you can apply to the online lottery which allows four month advance reservations for 10 lucky visitors a day, or you can try your hand with the walk-in lottery in Kanab the day before you are hoping to visit the Wave. The walk-in lottery, of course, creates a lot more uncertainty and makes advance planning much more difficult - but it also has significantly better odds than the online permit drawing. 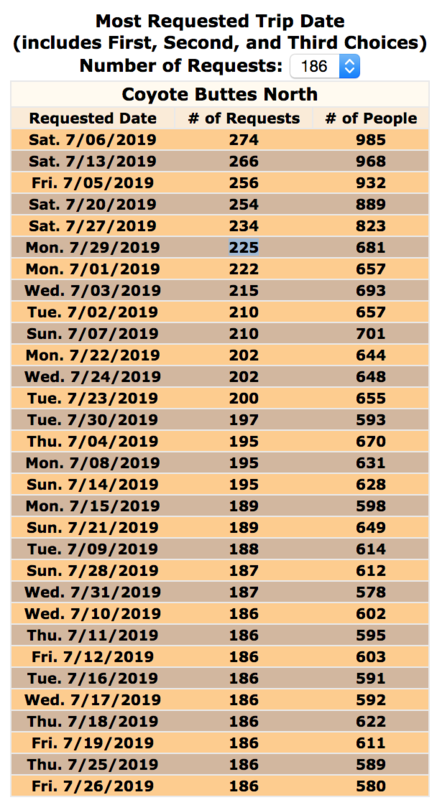 Case in point: the online lottery, which runs on the first of each month four months ahead of the requested permit days (meaning April permits are being allocated on January 1) tallies up to ~1000 people per day vying for the ten available permits. 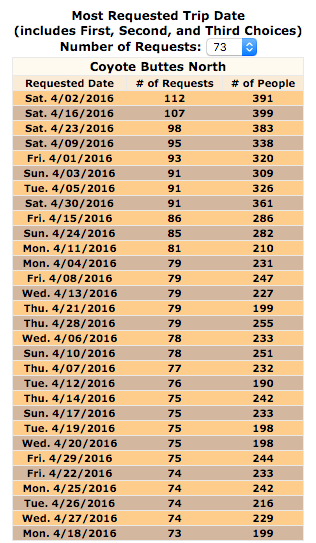 Depending on the time of year and the day of the week, your chance of getting an advance permit ranges somewhere in the 1-5% range - your odds of being successful are one in twenty on a “good” day which is equivalent to “midweek” and “off-season”. If that’s not bad enough, things are continually getting worse: the official permit website actually cites success chances in the 4-25% range… but that was for 2013, and permit request have been skyrocketing; just take a look at the side-by-side comparison between 2016 and 2019 below. The walk-in lottery in contrast “only” sees between 60 and 300 hopefuls who congregate at the permit office in Kanab each morning to put their name in the hat, quite literally, for access to the Wave the following day. According to the local rangers, the record for walk-in permit hopefuls to date was set on Black Friday 2018 with close to 400 permit applicants crowding the office - which still makes for better odds than the advance lottery. Let’s assume you actually managed to get one of those elusive slips of paper… now what? Surely the hard part is over! (Or on the flip side, if you didn’t get a permit, surely you could just sneak past the trailhead and take a quick look around in a victimless crime, right? **) Not so fast. Getting from the car to the Wave is 100% manageable for most able bodied folks but it does take work and it is an adventure in off-trail navigation. After you’ve managed to get a permit, the ranger station will provide you with a little pamphlet that contains photographs of turn-by-turn directions and critical landmarks to use for orientation. While the trailhead and the first mile or so of the trek are obvious, the well-worn dirt trail soon turns into slick rock with no trail markings or foot prints to follow. You need to know where you’re going and be aware of your surroundings. **This may be an opportune spot for a comment on attempting to circumvent the permit system: sneaking in without the benefit of the permit is not a good idea; besides the route finding challenges and the fact that attempting to see the Wave sans permit is ethically indefensible you’ll also risk $100,000 in fines and up to a year in prison should you get caught. For what it’s worth, on the day that Paul and I got to hike out there we ran into not one or two but THREE permit patrols. Don’t be that guy (or gal). Contrary to Horseshoe Bend, the trailhead for the Wave is not right off a major highway. To reach the start of your hike you have to get through a little more than eight miles of dirt road driving, which can range anywhere from mellow to completely impossible. I have driven the access road about a dozen times by now, and I’ve seen it smooth enough for a Kia but also so slick and rutted from just six hours of continuous rain that a 4x4 jeep was at the verge of getting stuck. The road crosses two drainages that are prone to flash flooding, and then there is the road surface itself: nasty desert clay which may be solid when dry but offers all the friction of black ice when soaked. …but you still have to win the permit lottery to be allowed to go. A guide can help you both with the off-trail navigation and with vehicle trailhead access if the road isn’t passable for your everyday car, but hiring a guide doesn’t change any of the permitting requirements. That said, there are plenty of guide services in Kanab that can be hired on short notice; many will have next-day availability should you decide in favor of the guided approach on a whim after you’ve secured a walk-in permit. If you’re a photographer, you know the importance of the golden hour: many destinations are best photographed right after sunrise or shortly before sunset. Not so the Wave - even though its main feature has an easterly aspect that seems to make the landscape prone for sunrise shots, the surrounding topography is such that the sun doesn’t hit the Wave itself until after golden hour. In fact, the best light for the classic shot is right during mid-day when there are no stark shadows obscuring parts of the main feature. Finally, a question that I’ve been asked repeatedly: is the Wave really worth the effort? My answer: unequivocally YES. Go put your name in the hat for the lottery; good luck!